For many older adults, driving is a way to maintain independence and mobility. In 2015, there were over 40 million drivers aged 65 and older, which is more than a 50% increase since 1999. While these older adults enjoy retaining their mobility through driving, the risk of injury or death increases as they get older. 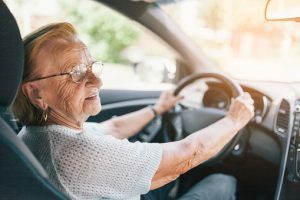 It is important for these drivers to understand the risks they face on the road that affect their age group, especially as Oregon is a state that is aging faster than much of the nation. Nationwide, 1 in 6 drivers are over 65, are twice as likely to have a medical condition that affects their driving, and 4 in 5 take medications that may further affect their ability to drive. In 2015, 6,800 senior drivers were killed while more than 260,000 were treated in the emergency room for injuries due to an auto accident. That amounts to an average of 19 deaths and 712 injuries over that year. For older drivers, the risk of being involved in an auto accident starts to substantially increase in the 70 to 74 age range, reaching its highest levels for drivers 85 and older. These increased risks can be attributed to an increased susceptibility to injuries and medical complications that accompany the demographic. In particular, declining vision and cognitive function are prominent risk factors as they affect a driver’s ability to react to situations on the road. With increasing amounts of older drivers on the road, these numbers can increase if the right precautions are not taken. Elderly drivers already are reported to drive impaired at significantly lower rates than other age groups, 6 percent for drivers aged 75 and over compared to 28 percent for drivers aged 20-24. It is reported that they tend to drive less when conditions on the road are not ideal, such as during inclement weather. Consider potential alternatives to driving, such as riding with a friend, using public transit or ride share services. If you’re an older driver or have an older loved one who has been injured in a car accident in Oregon or Washington, contact Zbinden & Curtis today. An experienced car accident lawyer can analyze your case, determine how best to proceed, and ensure your rights are upheld.